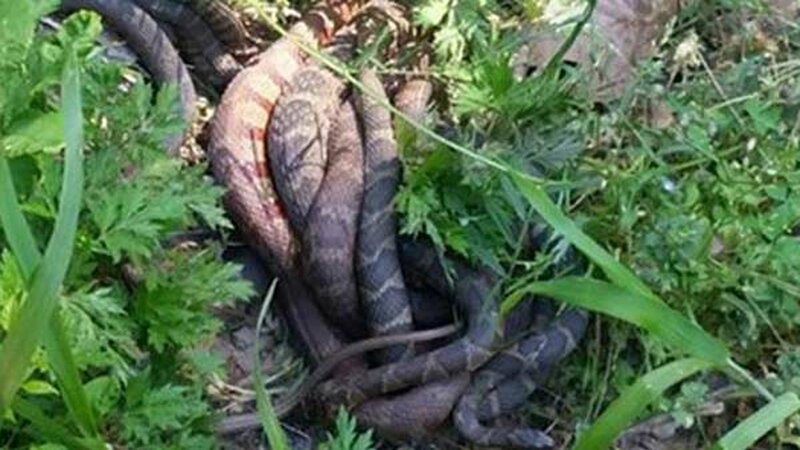 CHARLOTTE, North Carolina -- The woman who claimed to have taken a photo of what appeared to be a snake mating ball while walking along a North Carolina greenway admitted she was sent the picture from a friend. The photo, which has made waves throughout social media, was taken Monday morning, according to the Charlotte Observer. Charlotte native Christina Proffitt, 23, initially told local news outlets that she took the picture on Little Sugar Creek Greenway. "Everyday I see four or five snakes every time, but I've never seen 10 to 20 all balled up like that," Proffitt told WCNC. "No one's going to believe if I didn't take a picture. So, pics or it didn't happen." On Thursday, Proffitt admitted that her friend, Jessica Jackson, took the picture and sent it to her and several other friends. After learning that Proffitt took credit for the picture, Jackson texted her and said, "a little bummed I didn't get credit for it, and I feel robbed." Two other women allegedly talked Proffitt into claiming photo rights so one of them could report the story to WBTV and bolster her chance of landing a job at the Charlotte-based television station. "It was dumb, and terrible judgment on my end," Proffitt told the newspaper. "I take full responsibility. There's no excuse for what I did. I feel so terrible." Proffitt's original Twitter photo has since been removed.